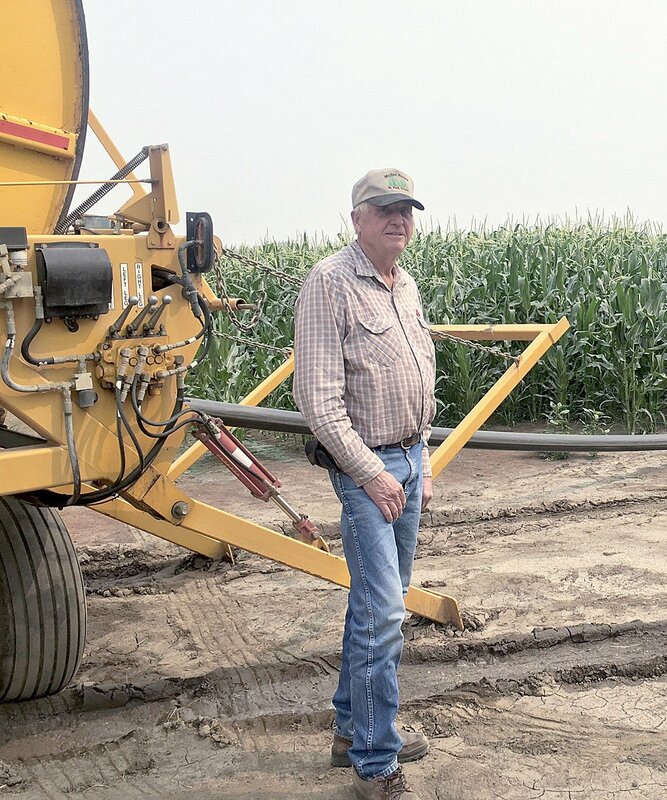 Jerry Mullen still works on the farm helping with the irrigation, though his son Dan manages most of their operation. The original homestead portion of the farm is under the management of his cousin, Jim Mullen. The sign in the front yard of Jerry Mullen's yard was a gift from the rest of the family. Still sitting on a portion of the original Mullen farm, this barn was built during the first part of World War II. The top part of the barn was used to store feed and below was a dairy, Jerry Mullen said. A Donation Land Grant slip for Benjamin M. Robinson of Dayton, Ore., for 1872 taxes on the Robinson Stillwell Taggart Farm in the sum of $39.52. A house built on the Robinson Stillwell Taggart Farm around 1849 near Dayton, Ore.
Mullen Farms is one of two sesquicentennial farms designated this year by the Oregon Century Farm and Ranch Program along with 12 century farms. The sesquicentennial award recognizes families who have continuously farmed some or all of their original family acreage for 150 years or more. Farms designated century farms have been in continuous operation 100 years. “We are definitely a family farm,” said Jerry Mullen, great-great grandson of one of the farm’s founders, Patrick Mullen. Through the years, it has been important to every generation to keep the farm going and in the family, Mullen said. Mullen never knew his dad, who died when Mullen was two years old, but Mullen spent a lot of time with his grandfather, Charles S. Mullen Sr., who taught him about the farm. On the property is a house where Mullen’s grandfather was born and lived for 101 years. “It was important to my granddad especially that we kept the farm together,” Mullen said. Mullen recalled growing up on the farm mentioning how they had their own pigs, dairy and granary. “I grew up with all that to self-sustain and then grow enough to make some cash,” Mullen said. Over time the farm has grown from 150 to 1,300 acres as the Mullen family has added other farms and land to the business. They now grow mainly seed crops and hazelnuts. The other sesquicentennial farm honored this year is the Robinson Stillwell Taggart Farm in Dayton in Yamhill County. It was founded in 1844 when Benjamin and Elizabeth Robinson came to the Oregon territory on a wagon train. The farm is still in the family, though pieces of it were sold off during the Depression. “(The farm) has been a source of pride for our family for generations,” said John Taggart, current owner of the farm. • Howard-Allstott Ranch in Umatilla County was founded by William Howard in 1884, when the homestead claim was approved. The ranch was eventually passed down throughout the generations to Richard and Dorothy Howard Allstott, the great granddaughter of the founder. • The Rockwell-Doherty farm was founded in 1906 by Seth and Sarah Rockwell in Umatilla County near Pilot Rock. The farm has seen many different uses through the years, including fruit orchards, raising horses and growing irrigated wheat, pasture grass and alfalfa. Richard Doherty now runs it for the family. • Brown Farm, in Morrow County, goes back to 1912 when Chris P. Brown, an immigrant from Denmark, purchased 350 acres to grow wheat in the Willow Creek drainage northwest of Heppner. His grandson and his grandson’s wife, Chris E. and Kathy Brown, currently run the operation. • Sandoz farm was founded in 1880 in Wasco County by three brothers, Alphonse, Arnold and Charles Sandoz. They grew root vegetables, fruit trees and grapes. Ted, Charles Lee and Mary Sandoz are the third generation and operate a farmstand where they sell USDA beef and pork along with fruit, vegetables and other products. The awards ceremony for the century and sesquicentennial farms will be at 11 a.m. Saturday at the Oregon State Fair picnic grove area. The Oregon Century Farm and Ranch Program is administered by the Oregon Farm Bureau Foundation for Education. It is supported by a partnership among the Oregon Farm Bureau, the State Historic Preservation Office, OSU University Archives and by generous donations of Oregonians. For information, contact Andréa Kuenzi, program coordinator, at 503-400-7884 or cfr@oregonfb.org.